ACON manufactures miniature RF products in the form of RFS (RF Switch) and RFC (RF Connector). 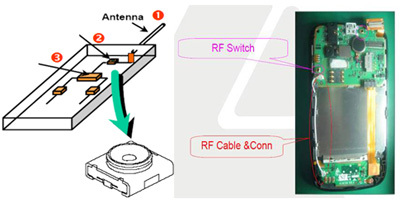 RFS (RF Switch) is a connector mechanism connecting an antenna and its main board, mainly used for testing the signal function of a cellphone or of any portable device with antenna function. A mini RF test plug would be used to probe into this RF Switch to test for the antenna performance. RFC (RF Connector) like RFS, is a connector connecting the antenna and the main board so the antenna/MB can receive/transmit signal smoothly through the connector system.